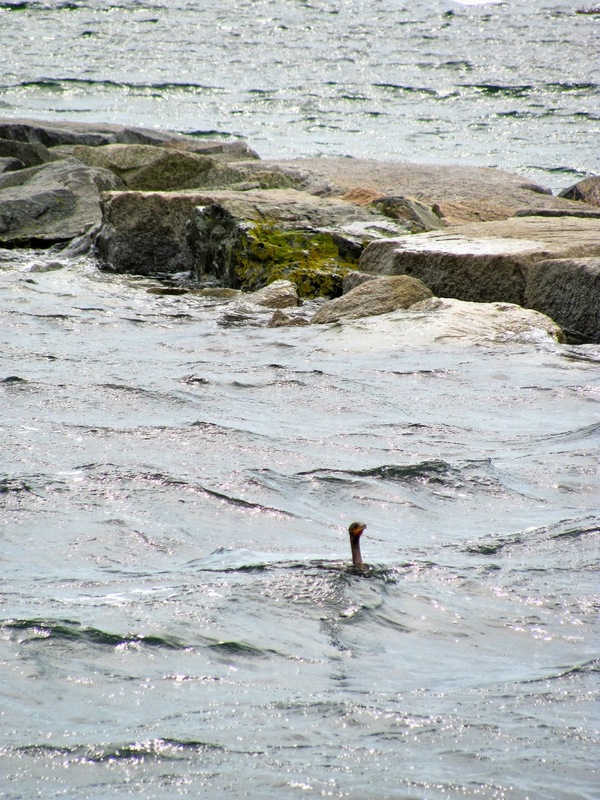 A cormorant bobs on an exceptionally high tide at the West End Breakwater. Unusually deep tides have edged higher and higher along the length of the West End Breakwater recently. Over the last several weeks I've seen the tide rise well above the average high tide mark on many, many days. Part of the reason may well be because of the full moon, and I don't pretend to know how all that moon and tide stuff works, but we had tides of ten-and-a-half feet during the last full moon and during the time of the very slightest sliver, so it isn't all about the phases of the moon. Tides have risen above 11 feet several times recently. Last week, amongst a group of people, I wondered out loud if these seemingly higher tides could have some relation to the melting polar ice caps. A murmur of assent spread through a good bit of the crowd as many people nodded and began conversations with those around them, with one marked exception: a man who quietly turned slightly red in the face as his jaw clenched and he began aggressively shaking his head from side to side, conveying an angry but silent "No way, you idiots" message to the rest of us. His wife turned her head up and away from the crowd, looking over her shoulder as though there were suddenly something compelling to watch going on behind her. It was plain that she knew better than to have an opinion on this topic. Why are these folks who insist there is no such thing as "climate change" so angry? They can't all have stocks in the oil companies and auto industry, can they? I nearly ended up in a fistfight with my sister a few years ago, before she retired from her lofty position in the accounting department of the Porsche automobile company, when I innocently muttered something about the world being better off if we all drove cars that got better gas mileage. It was strictly the company line coming out of her mouth as she went off like a rocket about global warming being the most vile and insidious lie ever perpetrated on the American people. Some folks still cling tenaciously to the opinion that it doesn't matter one iota how much energy we use in our quest for more and fancier "stuff." The great blue heron is usually seen in the wetlands, in deeper water. At any rate, the tides have been noticeably high here recently, whatever the reasons might be, with the water splashing right over the top of the breakwater a bit on windy days that bring whitecaps into the harbor, so be a little cautious when you go out for a walk to Long Point or to Wood End. And keep an eye out for the herons in the marsh to the right of the breakwater. One was found on the tidal flats just a couple of feet from the rocks at low tide the other day, which was a pretty unusual sighting.